We like being transparent here at Bondora, and we like giving you our loan data for your own analysis. You can slice and dice all the data however you want to come up with your own method of selecting loans for investment. When you look at the Public Reports in the “Shared Legend between Public and Private” there are many different data points that you can look at across loans. For example, a couple of them are BidsPortfolioManager and BidsManual, which ables to compare how many investment offers are made on a loan through Portfolio Manager or done through manual selection. Maybe you have developed a method of loan selection where you think that selection by one of these methods is more important so you give that more emphasis in your search criteria. We want you to have as much good quality data as possible to make your loan investment decisions, so we are releasing 14 new data points for the „Investments list“ report which you can see in this table below. These include items like PenaltyLateAmount showing the amount of late charges the borrower has to pay and NextPaymentNr which shows the count of scheduled payments made. Another important data point is ReScheduledOn, which shows when a new payment schedule was assigned to a borrower. All these new data points are not only available in the Public Reports and Investments list report, but they are also mostly available in the Investments section of your Dashboard (see image below). Here in the upper right corner you can click to set the new data points in your own Settings and set them however you wish. 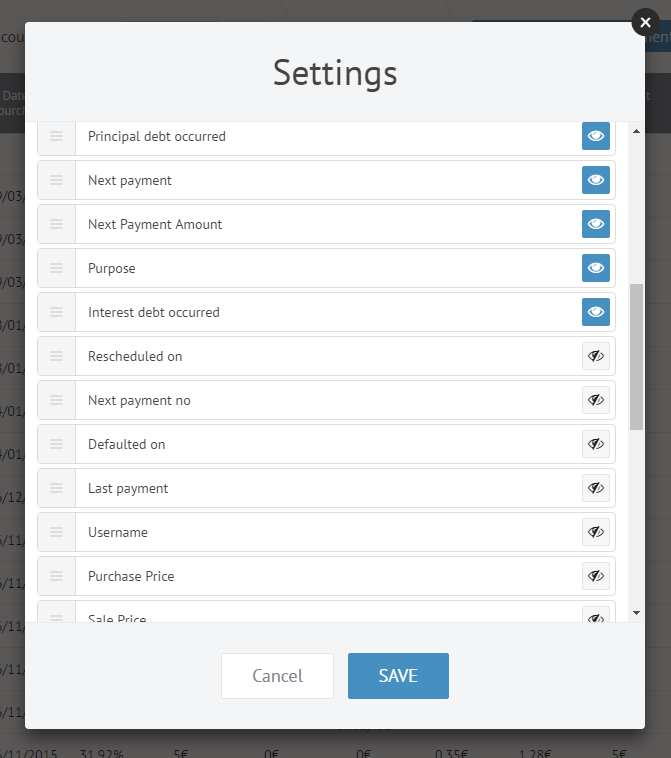 It is particularly helpful to include the Last Payment and Next Payment fields in your Settings especially if you are looking to buy more loans or sell some on the Secondary Market. This is a great way to get a quick glance of what your repayment history on your loans looks like. Today if you saw that all your loans have paid for September already then you would know in about 10 seconds that your portfolio is Current. If some show the last payment as July or June, then you know you have some late payments or slow pays to watch. Having good data to make your investment decisions is our number 1 priority and this should help you with your loan selection criteria moving forward.